Award-winning author and radio host Chris Fabry tackles a pair of meaty issues with nuance and personality in his latest novel Not in the Heart. It’s a fine piece of storytelling that puts Fabry’s authentic approach to creating first-person point of view front and center to get inside the head of a conflicted, memorable main character. Estranged from his wife and two grown children, journalist Truman Wiley slinks back to Tallahassee, Florida with nowhere else to turn after his gambling debts have driven him from his beachfront cottage in South Carolina. Once there, he’s offered a tantalizing proposition: convicted murderer Terrelle Conley is on death row, one month away from execution, and he’s offered his heart to be transplanted into Wiley’s son’s chest after Conley dies, if Wiley will agree to write the man’s memoirs. Conley’s not interested in proclaiming his innocence; rather, he wants to set the record straight before he dies, and in the process save the life of Aiden, born with a heart defect which has left him in the ICU and on death’s door. Wiley’s a mess: addicted to gambling, stuck in a self-defeating rut, and avoiding visiting Aiden in the hospital. He throws himself into the work of interviewing Conley and others connected to the murder. In the process, his instincts tell him Conley is innocent. When Florida governor Carlton Townsend takes an interest in the investigation, Wiley feels the pressure to deliver a confession from Conley. At the core of the story is Wiley’s no-win situation: if his investigation exonerates Conley, his son doesn’t get Conley’s heart. On the other hand, if he sits on evidence of Conley’s innocence just to save his son, he condemns an innocent man to die. This ethical quandary faced by Wiley hearkens to similar territory made popular by Jodi Picoult and others. 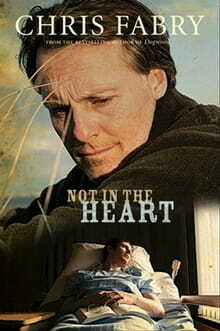 Unlike those hot-button novels, Heart never seems to be simply about the issue. Instead, the dilemmas facing Wiley seem to be metaphorical for any kind of personal heartache faced by all of us. Fabry’s lack of sermonizing about doing the right thing is refreshing. He allows the story to quietly ask the questions, about the justice system, health care system, and more personal matters such as family reconciliation, and grace. In the process, Wiley’s journey becomes relatable. Even if the specifics of his personal demons—he’s a gambler and workaholic—aren’t familiar, the struggles he faces, and the questions he asks, are. Credit Fabry’s excellent characterization of Wiley with making all this possible. The primary strength of Heart lies in Wiley’s authentic voice. Most of the book is told from his perspective, and the voice is splendidly rendered. Unfortunately, those chapters written in third person point of view are less compelling, begging the question why Fabry would make this choice in the first place. The shifts from Wiley’s chapters to the third person narration are jarring and take us out of the story. Down to its final pages, Heart is a gripping read. While the mystery at its core is compelling, it’s Wiley’s inner conflict that’s truly engrossing. We want to believe a character like Wiley isn’t too far gone for redemption, but the story dares to ask the question, If a person believes he’s too far gone and refuses grace, is it too late? As the story nears its conclusion, it’s tough to turn the pages, as it’s clear that any conclusion will result in someone paying the ultimate price. In the end, however uncomfortable it may be, this is a journey worth taking.